Chennai: The Tamil Nadu government has decided to release three men and one woman convicted of killing former prime minister Rajiv Gandhi in 1991. The death sentence of the men was commuted to life in prison by the Supreme Court yesterday. Chief Minister Jayalalithaa’s cabinet met this morning and decided to free the four convicts a day after the court had left it to the state government to grant them remission. Murugan’s wife Nalini Sriharan’s death sentence had been commuted earlier on the intervention of Rajiv Gandhi’s widow, Congress president Sonia Gandhi. The Supreme Court had on January 21 commuted the death sentences of 15 convicts, announcing that “inordinate and inexplicable” delays in carrying out executions were grounds for reducing their original punishment. Santhan, Murugan and Perarivalan were convicted in 1998 for Mr Gandhi’s assassination by a woman who greeted him with a garland and a bomb strapped to her chest during a rally in 1991. Their mercy petition was sent to the President, the last stage in the process of appeals, in 2000 and was rejected 11 years later. 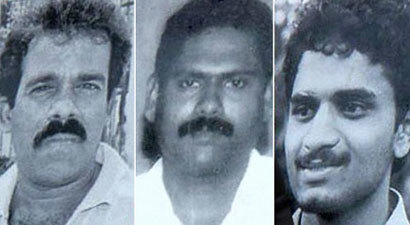 Their hanging was stayed in 2011 on the orders of the Madras High Court.